'Help, I'm Hosting': Ted Allen Dishes On Vegetarian Thanksgiving, Cooking Wild Turkey From menu planning to dealing with the unexpected, NPR's Weekend Edition's new holiday series offers advice to those hosting friends and family this holiday season, so it's a stress-free time for all. 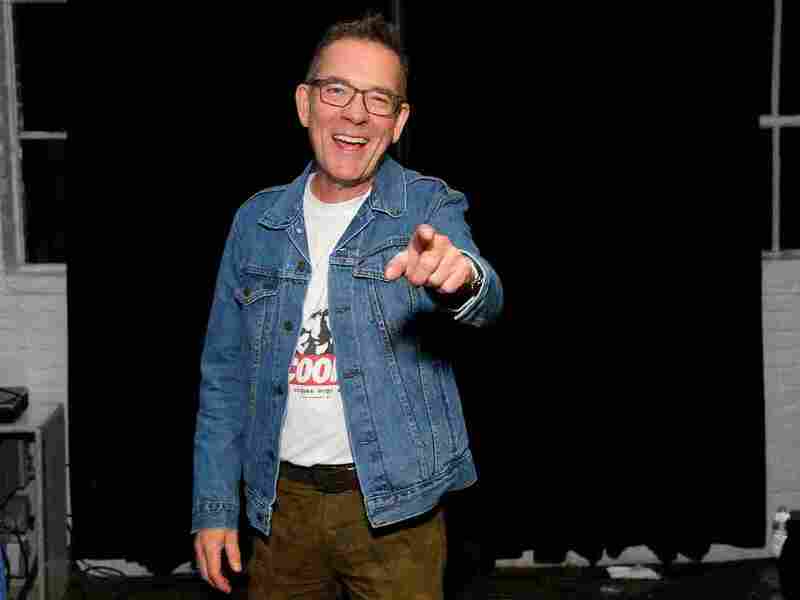 In a new segment, "Help, I'm Hosting," on this week's Weekend Edition with Lulu Garcia-Navarro on NPR, Ted Allen offers advice for people hosting family and friends over the holidays. Thanksgiving is four days away, and with it comes a holiday season of friends, family, fun and of course, food. Now about that food part: If you're hosting on top of all the fun, you get a big helping of responsibility, last-minute preparation and the unexpected. NPR is here for all you hosts with a new holiday advice series called, "Help, I'm Hosting!" Last week, we asked you to send in your questions about the big meal, and we have a special guest to walk you through your Thanksgiving hosting anxieties: Ted Allen. He is the original food and wine expert on Queer Eye and the host of Chopped on the Food Network. Robert Flynn from Kansas City, Mo. : This is the first time that I've turkey hunted and gotten a wild turkey, and it's been cleaned, in our freezer, ready to go. And I was just wondering what kind of preparation and cooking differences there might be. Ted Allen: I have a friend who lives up in the Catskills; around him, people are hunting turkey all the time. My understanding is that on a wild turkey, the only part that's edible is the breasts, and so, I think you might not have enough to feed enough people if you're relying on that. I would say research that a little more, Robert, but I think you might want to have a backup. Samantha Lin, who's living in Rome: I don't have an oven, I live in a very tiny apartment, and I have no idea how to cook my turkey. I feel a lot of pressure because this is the first Thanksgiving that many of my foreign friends will experience, and I'd like to give them something good. Ted Allen: Since she doesn't have an oven, my first question is, do you have access to a barbecue kettle? It's tricky, but you can do a really nice turkey with charcoal. I would have her come back with a counterproposal. ... another sort of general way to make your Thanksgiving easier. Do a potluck, and in her case do a potluck at the home of a friend who does have an oven. Otherwise, why don't you just get pizza? Mary Beth Bosanski from Rapid City, Mich., writes: As a relatively new onset vegan I have had the pleasure of attending Thanksgiving dinners and bringing a dish to pass that was vegan friendly. This year offers a bit more challenge and stress with the possibility of hosting this iconic meal. Tofurkey just seems wrong, not to mention unhealthy. Ted Allen: I have many vegetarian friends, and I have a couple that have served me meals in their home, and it's almost like a complete paradigm shift. People who really know how to live a vegan lifestyle – I hate to, even to dismiss it that way – learn a lot of skills that we meat eaters don't typically acquire. I agree with the idea that a tofu turkey is kind of, just seems kind of wrong to someone who's trying to get away from meat. Why would you want to simulate even the texture? I would think about non-American ethnicities that lean heavily on vegetables. There are so many cultures that are like that. Like maybe something from Morocco or something from a place that does a great deal of vegetable cookery that doesn't depend on roasting meat. Do something a little bit creative. To me, I don't look at it as a burden. I look at it as something that focuses my plan for the dinner and gives me a challenge. You can still make a turkey but provide something substantive for the vegetarians in your life. Lulu Garcia-Navarro to Ted Allen: What is your biggest Thanksgiving disaster? Because mine was the fridge actually died the day before Thanksgiving. I had nowhere to keep anything. It was a disaster. Ted Allen: That's pretty bad. That's really bad, and also probably a lot of the stores are closed. I used to work at Chicago magazine, and our dining editor – who was responsible for the critics that reviewed all the Chicago restaurants and really was an important voice in the Chicago restaurant scene – I invited her over to my place, and I was going to start with some sweet rolls. And I had those in the oven without a pan underneath them. Oops. And you can see where this is going. So the second she rings the doorbell, I start to smell smoke, and sugary butter had kind of like gushed over the sides of the pan and was in flames on the bottom of my oven. The minute the dining editor of Chicago magazine walks in the door, she's greeted by a cloud of smoke and she, was she nice about it? No! She'd never let me hear the end of it. NPR's Sophia Boyd, Ned Wharton and Steve Tripoli produced and edited this story for broadcast. Nicole Hernandez produced it for digital.